Even as winter clamps down, our polar ice cap continues to dwindle. 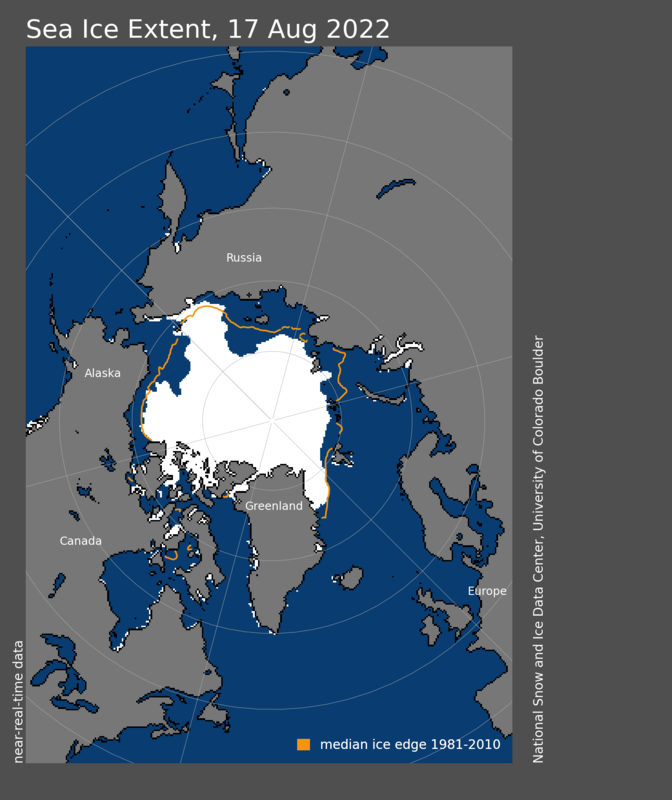 Despite the arrival of frigid winter temperatures north of Alaska, the sea ice of the Arctic Ocean ended 2011 far below average in both extent and volume, continuing its decades-long shrink toward summer oblivion, according to the most recent estimates posted online by polar observers. The total mass of ice -- its surface footprint plus the bulk hidden beneath the surface -- has never been lower for this time of year. The area covered was third smallest since 1979, with vast areas of ocean north of Europe remaining ice-free. "Ice extent was particularly low on the Atlantic side of the Arctic, most notably in the Barents and Kara Sea," reported the National Snow & Ice Data Center in its Jan. 5 update. "The eastern coast of Hudson Bay did not freeze entirely until late in the month: normally, Hudson Bay has completely frozen over by the beginning of December. In the Bering Sea, ice extent was slightly above average." The polar cap has now lost almost half of its December volume since 1979 -- with much of the thick, multi-year ice that previously formed the ice cap's bedrock, so to speak, exiting into the Atlantic Ocean during summers. The total amount of ice in the Arctic remained at least 37 percent below the long-term average, explained a new analysis that drew on computer models, satellite feeds and observations by ships and submarines. Ice volume as of Dec. 31 was estimated to be lower than any previous New Year's Eve on record, as depicted on this chart posted by the Polar Science Center at the University of Washington. Volume can't be measured directly, but the NSIDC satellite observers regularly snap eye-in-the-sky images of the ice cap and update their analysis daily and post them here and here. This ongoing monitoring suggests that the winter of 2011-12 has so far failed to turn the corner on a trend that might deliver an ice-free Arctic during summers within a decade or so. The area of the Arctic Ocean covered by at least 15 percent floes averaged only about 4.78 million square miles during December -- the third lowest seen for that month since satellite monitoring began in 1979, the NSIDC said. Only Decembers of 2006 and 2010 were lower for that month, but the five of the six lowest Decembers have all occurred during the past six years. 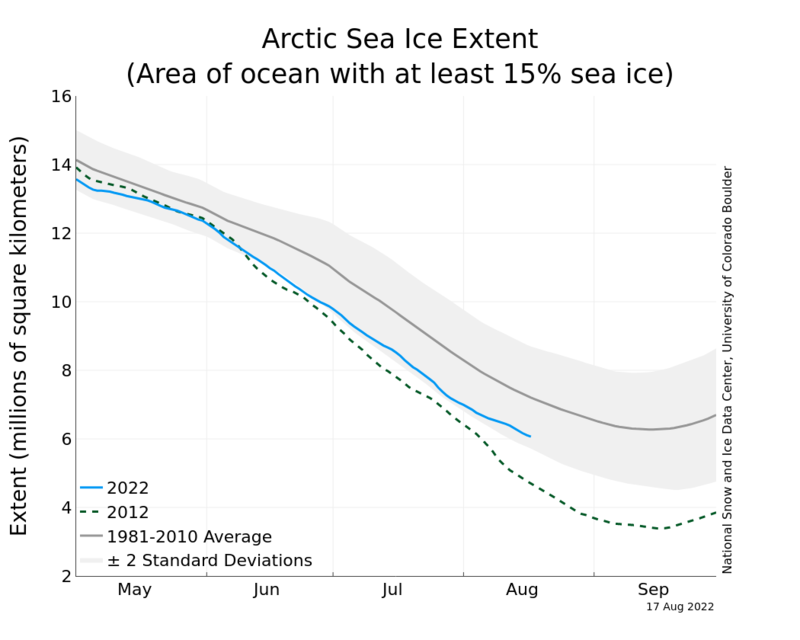 "For the Arctic as a whole, ice extent for the month remained far below average," the analysis explained. "The Arctic sea ice cover grew slightly faster than average, but December started out with a lower-than-average" area covered. To put this loss into perspective, the Arctic has been losing 3.5 percent of its December ice cover per decade for a generation. An ice-bound wilderness larger than Washington, Oregon, California and Texas combined has completely disappeared from the Far North's early winter habitat. Although the extent and volume of ice depends largely on the accumulated losses of previous seasons, one factor complicating how to interpret this season's low cover is a shift in a polar weather pattern called the Arctic Oscillation. During the past two winters, the old AO (as climate nerds call it) has been in a "negative phase" -- meaning that high pressure over the pole combines with lower pressure further south to produce especially frigid winters in the Lower 48 states and Europe and generally warmer temperatures over the pole. But the AO has reversed this winter, morphing into the "positive phase" with the opposite impact for the Northern Hemisphere. "In the positive phase, higher pressure at mid-latitudes drives ocean storms farther north, and changes in the circulation pattern bring wetter weather to Alaska, Scotland and Scandinavia, as well as drier conditions to the western United States and the Mediterranean," the NSIDC explained in its analysis. "This weather pattern helps to explain the low snow cover and warm conditions over much of the United States and Eastern Europe so far this winter." 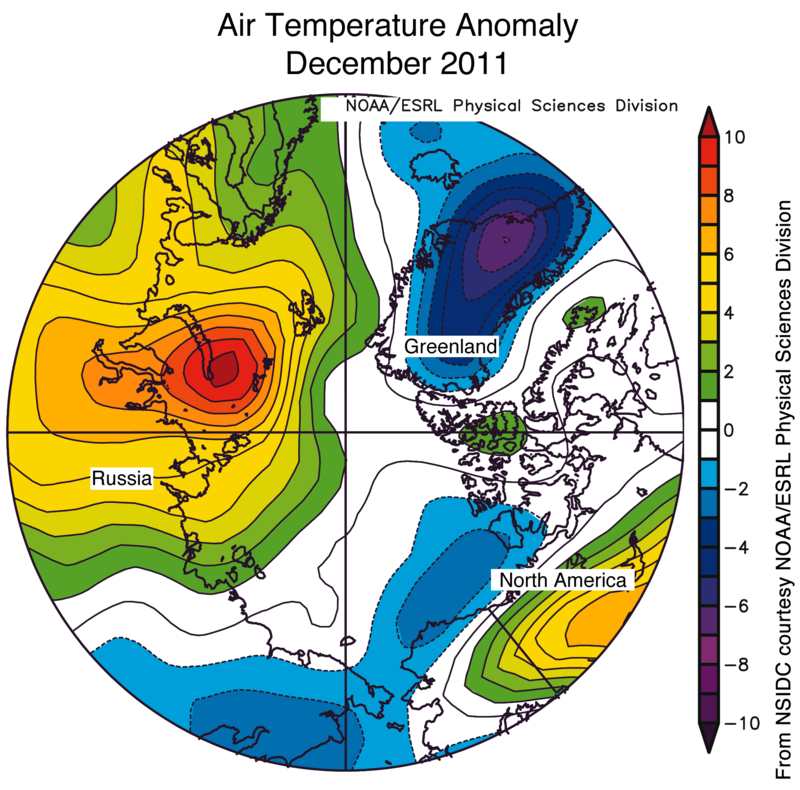 As expected, air temperatures were generally lower over much of the Arctic, especially north of Alaska. But much higher temperatures were seen in the Kara and Barents seas north of Europe, slowing the formation of new ice there. Higher-than-average temperatures in these regions stemmed from two major factors. 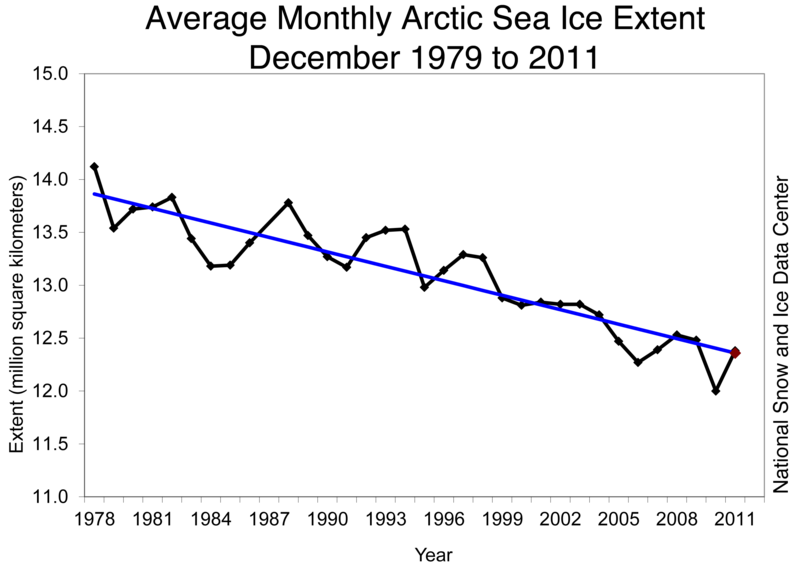 First, where sea ice extent is low, heat can escape from areas of open water, warming the atmosphere. Second, surface winds in the Kara and Barents Sea ice blew persistently from the south, bringing in heat from lower latitudes. This imported heat also helped to keep sea ice extent low in this area. Conditions over Canada were also unusually warm during December, but conditions over southeast Greenland have been 6 to 8 degrees Celsius (11 to 14 degrees Fahrenheit) colder than average, partly because of northerly winds in the area. The latest developments come after sea ice shrank to one of the smallest summer extents seen during the past 30 years, jeopardizing its role as a stabilizer of Earth's climate. Over time, the loss of ice speeds up climate warming because darker open water absorbs more solar energy than reflective white floes. Dwindling summer ice also means destruction of habitat for healthy populations of polar bears, walruses and seals.